Finding a job was never as hard as it has become now (competition these days!). Although, there are numerous sites available to help you with that, going through all the listings on every such site is a quite tedious job in itself. As always, Google is here with a helping hand to bring you out of the situation, providing some relief. 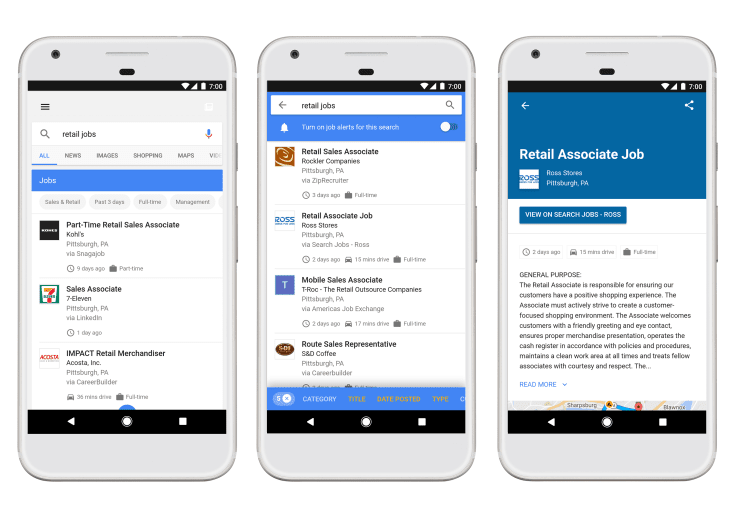 Google today launched an all new AI powered job search feature which will be integrated within its main search page. From now onward, one can easily go through jobs posted on various online job boards like LinkedIn, WayUp, DirectEmployers, Monster, CareerBuilder, Facebook and others in a single go. Not just that, the search engine is going to list jobs posted on the company’s homepage as well. This new AI driven feature is surely going to bring some ease to the whole job search process. You just have to type simple queries like “jobs near me,” “writing jobs”, “jobs in ABC company” etc. into the Google search bar and that’s it. After that you will be redirected to a job search widget showing you the filtered results. There you get even more options which will further refine the listing based on categories, title, date of posting etc. if it’s needed. Once you are sure about what you are actually looking for, you can save that final query and start notifications which are going to alert you whenever there is a job posting which matches your ‘saved query’. Nick Zakrasek, Google’s product manager for this project says “Finding a job is like dating, it only takes one person to fill the spot”. But, one job is always posted on various sites (much like dating) and people will expect Google to provide a finer result overall. There lies the problem. Creating a comprehensive listing of the most detailed postings is lot of work to do. And we hope Google is not going to let us down. For now, it works only in US though. So, give it try if you are reading this in US.